For the above Combo meals, patrons have a choice of adding on Red Bean Soup for an extra RM1.60. I loved their Red Bean Soup for the red beans were soft enough and not overly sweet. Ivy’s Kitchen also offers side dishes other than the combo meals. A star side dish here would definitely be the fried Cincaru or hard tail mackerel (RM9 for two pieces). This is served stuffed with sambal. It’s rather difficult to chance upon this dish nowadays and Ivy’s Kitchen does it perfectly! The sambal is fiery hot and very fragrant. A must try! Fried Spring Rolls (RM3.80 for two) is another side dish that’s chockful of vegetables and served with a sour chilli dip. Pretty good though a tad bit oily for me. Ivy’s Kitchen also serves a Chicken Loh Bak at RM6 (Ivy’s Kitchen is pork free). The chicken tastes of lightly marinated five spice and is served with a chilli dippig sauce instead of the normal ‘loh’ (starchy sauce) commonly found in hawker stalls. Still, I reckon this chicken loh bak makes for a great snack and would be especially popular with children. Another Nyonya dish available here is the Jiu Hoo Char (stir fried cuttlefish with turnips and carrots) RM8. Meant to be placed on top of a lettuce leaf, topped with some spicy sambal, wrap and then eat. This local delight was pretty authentic but I did find it a bit too salty for my liking. Finally, we tried Ivy’s Kitchen’s Penang Assam Laksa (RM5). A generous portion with lots of fish, I found the Assam Laksa to be surprisingly good. The broth is nice and thick and is definitely a delight! So the next time you’re craving for a good bowl of Penang Assam Laksa (especially in the evenings: have you noticed that most hawkers don’t sell laksa in the evenings, save for Gurney Drive?) head on over to Ivy’s Kitchen. Their version won’t disappoint. Other than combo meals and local delights, Ivy’s Kitchen also serves steamboat. And for the coming Chinese New Year, various set menus are available ranging from local home cooked delights such as “Kiam Chye Ark” soup to Curry Kapitan to Nyonya Fish Curry and more. 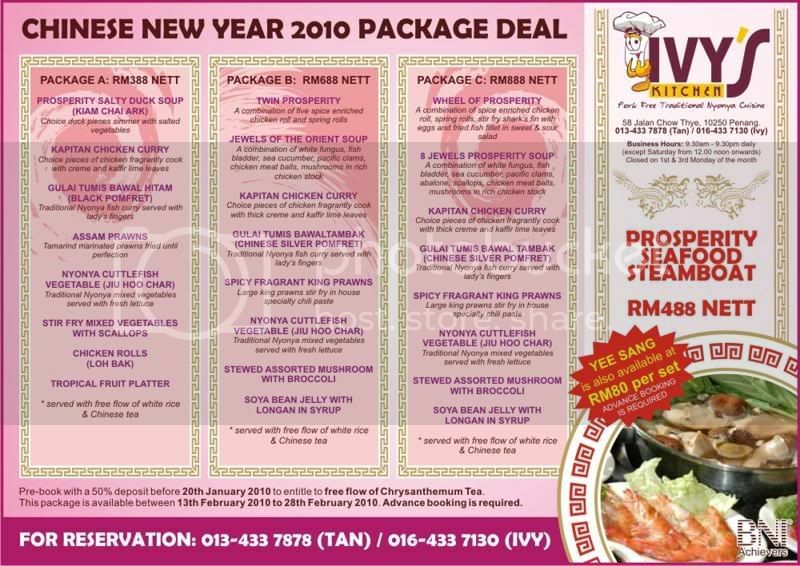 Special Prosperity Steamboat package for Chinese New Year is also available. Chinese New Year Menu is available from February 13 – February 28 2010. Advance booking is required. like te food there … but looks like cny package a little pricey huh?! .-= Duckie´s last blog ..Best way to end 2009 =-.